Get Brilliant Green Screen Photos & Videos in minutes! 123VideoMagic is an amazing software program which provides an easy way to remove the green screen and replace it with the digital background of your choice in a professional manner. It is a self-contained green screen program which doesn't require Photoshop or any other photo editing software to come up with stunning pictures & videos by eliminating green screen backgrounds. It is a brilliant product that allows you to use your own photos and videos as a replacement of the green screen. Time is money & 123VideoMagic permits you to generate your event photos in easy yet professional manner in just no time. If you have a camera, you would like to expand your photography horizons. And for this, you simply need to buy 123VideoMagic. Green screen backgrounds of images and videos can be replaced with background images/videos based on interesting themes. 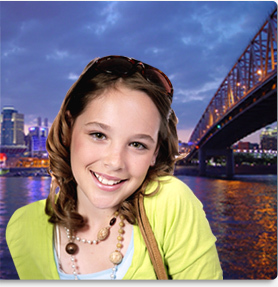 Users can select from 50 theme based pictures that are available in this green screen software. You can replace greenscreen background in your already existing Images/Videos with your favorite images by selecting them from your system's hard drive. Videos of different formats such as avi, mpeg, wmv and mpg can be edited with the help of this software. Images of jpg, .bmp, .gif, .png, .tiff, .jpeg formats can be edited. Images of various formats like .jpg, .gif, .png, .tiff, .bmp, .jpeg can be used as a background. 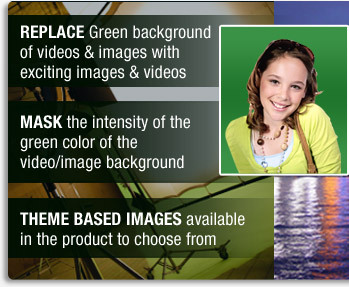 The software includes few sample videos along with theme images which can be reinstated with greenscreen background. Option to mask the image/video facilitates the users to mask the intensity of green color in the background. Videos can be saved & published in mpg, mpeg (MPEG4, MPEG2 and MPEG1), avi (Xvid, IVX, Cinepak and Divx), wmv or hav formats. Images can be published in the formats bmp, gif, jpeg or png. Professional photographers, who want an affordable alternative of green screen, can use this green screen background software. Amateur photographers can use 123VideoMagic to start making money with their photography. The software can be great family fun as you can take the pictures of your kids and later place them against different backgrounds from across the world. Their faces would light up to see these images. Teachers can use this software to take the students to different places while sitting in the class room. They can bring a green screen to the class and then take a photo of the student and put his/her image in the area that they are learning about. 123VideoMagic is of great help in Portrait Photography as in this you need not to buy all kinds of fixed backgrounds or construct elaborate sets. This wizard will help you to put exciting backgrounds in various formats - jpeg, .jpg, .bmp, .gif, .png, .tiff, to your images. Wedding Photography and Model Photography can be made more exciting with the use of 123VideoMagic.